Campbell, California is located in the southern region of Santa Clara County in the heart of Silicon Valley California. Campbell is south of Santa Clara and southwest of San Jose. The City of Campbell encompasses 6 square miles and is considered part of the San Jose metro area. Campbell has great weather and beautiful mountain views. The City of Campbell is largely a suburban residential community and home to approximately 38,000 residents. It is known for its quaint downtown, which offers numerous restaurants, shops and bars. 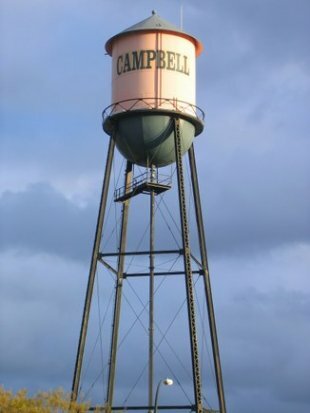 The historic Campbell Water Tower symbolizes the agricultural history. Campbell is home to the 250,000 square feet Pruneyard Shopping Center. Campbell is appealing to many because of the strong sense of community with a small town feel and excellent schools. Campbell has many percolation ponds. Many of the ponds can be seen off of Highway 17 which runs parallel to Los Gatos Creek. Los Gatos Creek is known for its par course which has paths for biking, hiking, jogging, and a great place to walk a dog. Los Gatos Creek Park is the largest park in Campbell. Campbell sits just a short drive away from Mineta International Airport, Silicon Valley’s work places, San Jose’s cultural attractions, Santa Cruz mountain wineries and Santa Cruz beaches. It provides easy access to highway 17/880 and connections to highway 85, 101, 280 and 680. In 1846 Benjamin Campbell came to California with his father, William Campbell. Approximately 5 years later, in 1851, Benjamin bought 160 acres in southern Santa Clara Valley where he cultivated grain and hay. Later this area became the historical downtown Campbell. Campbell sold his land to a railroad company in 1878. The first Campbell subdivision was recorded in 1887. In 1952 Campbell incorporated as a city. Track by track the orchards disappeared as the city of Campbell rapidly grew. Named after the founder, Benjamin Campbell, today Campbell is comprised largely of single-family homes. There are a few areas with condominiums, duplexes and apartments. Many of the apartments in Campbell are located on Campbell Avenue and Hamilton Avenue. Over the years Campbell has become one of Silicon Valley’s desirable places to live. The rest as they say … is history. With very few orchards remaining, Campbell is a great place to live and play. Feel free to search Campbell Homes for Sale.